Babies begin to learn right after birth, and even though babies develop at their own pace, choosing toys that allow them to practice developmental milestones is helpful. Knowing which developmental milestones babies normally reach in a given age range can help you decide which toys to purchase to help with those skills. Travel toys like the Car Seat Gallery. Between the ages of three and twelve months, your baby will reach many important milestones like rolling over, imitating sounds and grasping objects. He will begin to sit, stand and even walk with (and without!) assistance. 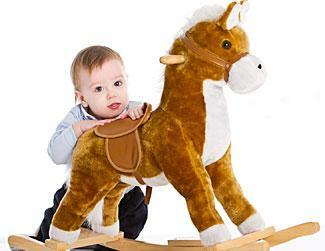 Your baby's world is expanding rapidly, and his toys should reflect his new horizons. Activities like sorting, stacking and pushing buttons are important early on during this developmental stage, while later on beneficial toys will include those that help develop balance, strength and hand-eye coordination. All the toys in the world won't provide the real stimulation that your infant needs. This should come from you! While you can use these toys to play with your infant, you should also play peek-a-boo and patty cake, talk to your baby and sing songs. Encourage your baby to grasp items. 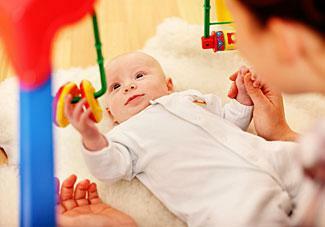 These are simple activities that will go a long way toward stimulating your baby's brain. Parents can't expect to put an educational toy in front of their babies and see effortless improvements. According to the publication Healthy Children from the American Academy of Pediatrics (AAP), the care and experiences parents provide affects their babies' developing brains. Educational baby toys work, but you have to make them work.